We were talking last night about children's birthdays. 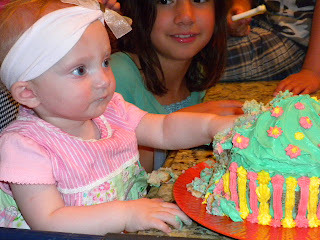 Why is it that the first child always gets the big bash on their first and the other kids get a cake if they're lucky?? 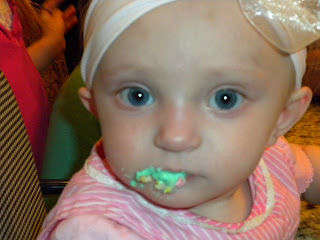 Lexi was one year on St. Patrick's Day. 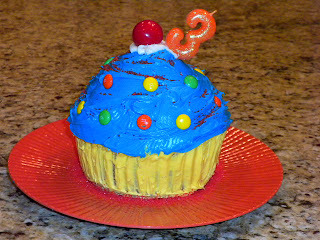 I managed to get the cupcake made and left the rest up to the family. We had a little party with a few cousins so it wasn't that bad. At least we have a photo to show her when she grows up!!! She got into it and even managed a bite on her own! I got the Giant CupCake pan before Christmas and decided my resolution for the New Year would be to bake each grandchild a giant cupcake for their birthday. So far I have done it, starting in January for Tiny, then Lino and Buddy. 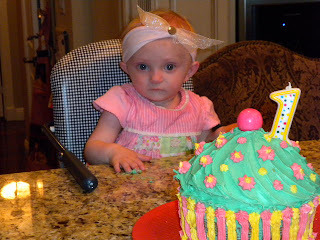 Tomorrow is Lexi's big numero uno so will be baking a pink one for her. 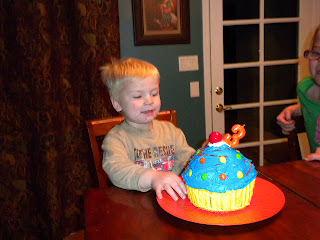 Sabra put a pick of Buddy's cake on her blog but I am going to post one too, for the two people that read my blog:) Buddy came to play a couple of days after his birthday and wanted to know why he didn't get the gumball on his cake. He was very excited at the time about the soccer balls. 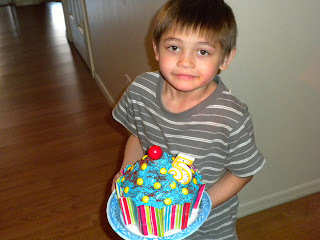 So I remided him he liked the soccer balls but he still wanted the gumball. I told him I did have a red one or a pink or white one. "I think I'll take a blue one." "I don't have a blue one." "Well, you can go down to my dad's shop and take a quarter and get a blue one, or a green one." What a wonderful little boy. I just love that kid!!! Anyway, here are my boys with their cakes! 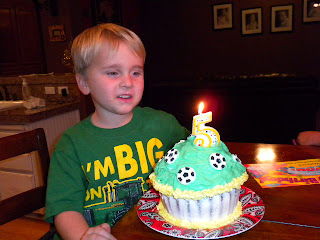 Happy Birthday to all four of my favorite little people born in the months of January and March!!! Twenty years ago yesterday,the Ides Of March, we moved into our house on Bardeaux. Crazy where that twenty went. Our life has changed so drastically, and mostly in the last month! But that's whining for another day I suppose. Anyway, Ceaser died and yesterday my mother fell down. Scared the living right out of me!! Then I was so mad, I mean sooooo mad!! And that is for another day too. I really can't be positive right now so I better move on!!! March, it came in like a lamb! Though most days I feel like I have been mauled by a lion,today however, was an exceptionally good day following an exceptionally good night. Mom slept from 11pm to 5am with a pit stop and then on into the morning, finally rousing around 9:30. We got dressed and had breakfast, then moseyed out for a spin in her stroller. We had a great laugh about how you start out life in diapers with someone pushing your stroller and you pretty much end life the same way. I almost dumped her out of the wheel chair, getting her out the door. Then I forgot to lock the brakes while I was hooking up the dog's leash and looked up to see her rolling down the street. I didn't even know the street sloped! We talked,laughed,looked at birds, well I looked and pointed, she couldn't see much. But she did like the smells and sun on her face. It was a good day! Then my brother form Montana arrived. She always loved Larry. He could make her laugh when no one else could. Happy days!!! Hoping for another restful night! Thanks to you who commented on the previous post with your kind and inspiring words. I appreciate them more than you could know.